The act of managing a team cannot be left to the mantra, “we will deal with it as we go”. It requires a conscious act and effort to set up a management process. Bluemix enables the management of agile teams with a variety of tools. When building your next startup team, ask the question: how will you manage your developers? The entire premise around Bluemix is to help you build and test your ideas. When creating a web application on Bluemix, the domain name of yourapplicationname.mybluemix.net is created in less than one minute. Therefore, you can start sending your link out to potential customers to start learning what you have set out to learn. You can’t learn without communicating with your customers. Bluemix enables this communication between your product and the customers in a seamless and quick fashion. Eric Ries notes that startups cannot be measured on traditional metrics such as revenue, customer acquisition costs, lifetime value of the customer, etc. It is up to you to define your own metrics. However, the built-in monitoring tools in Bluemix can help you track what matters most to you. If that isn’t enough for you, Bluemix contains several services that help you monitor and track your key metrics with analytics. Still if you aren’t satisfied with these solutions, you can use any other monitoring service so long as it can be accessed through RESTful APIs. The entire motivation and life-blood of Bluemix is to help developers rapidly build applications, gain validated learning, fail fast, and build the next MVP. With Bluemix, you will be able to push an application to the cloud in a minute, send the link out to your customers immediately, and use agile development to make the necessary changes. The pay-as-you-go model with a monthly free tier (yes, every month) will enable you to test and build applications for free or a small amount of money. By using Bluemix, you will be able to keep costs low while you are learning. This is exactly what Ries meant when he created the ‘lean startup’ model. 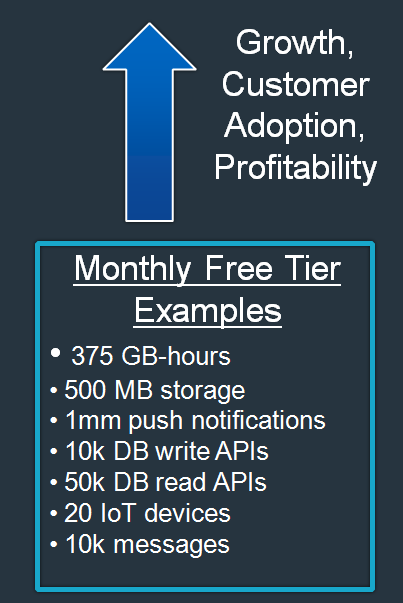 In Bluemix, the free tier for services and run-times (in GB-Hour) is substantial. The diagram above lists a few selected services to give you a flavor for how much free stuff you actually receive. If you are a lean startup, then you should be able to easily build a proof of concept within the free tier, and will only begin paying once you see your customers beginning to adopt your product and use your web or mobile application. The lean startup is a game changer. So, is Bluemix. Check out Bluemix, try out a sample application, and leave a comment or response about what you think about Bluemix. I love to hear readers feedback, thoughts, opinions, and suggestions. Thank you. Next Article How Does a Platform-as-a-Service Make Your Life Easier?